We service and repair garbage disposals of all brands. Is your garbage disposal not working anymore? Is it clogged, dirty or has an odor? Garbage disposals are a great way to dispose of food left overs and provide us with a convenient way to clean our dishes. Unfortunately a lot of people treat the garbage disposal as “jaws of life” and use it for all kinds of disposal purposes. Egg Shells are one of the hardest things on your blades even though they seem so fragile. Running your garbage disposal without water in another way to damage the effectiveness of your garbage disposal and will make build up of grind and dirt even more. We services all makes and models of garbage disposals from 1/3 horse power the 1 full horse power…If you ever get a bad smell coming from your disposal it is recommended that you grind a lemon in the disposal to eliminate the smells. Also you can grind ice cubes inside of the disposal to help sharpen blades to grind food. Drain Masters Plumbing can repair or service your garbage disposal for you to make sure it serves you for many more years to come. Can It Be Repaired Or Is It Time For A New Garbage Disposal? If your disposal has some age on it or is not sounding the same, it may be time for a major repair or a new disposal altogether. 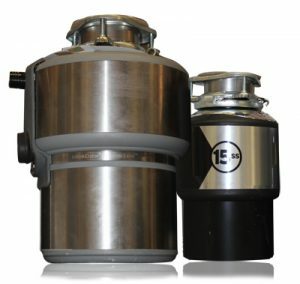 La Mesa, Pacific Beach, La Jolla, El Cajon, Santee, Rancho Bernardo, Encinitas, Carlsbad, or San Marcos and need help with your garbage disposal? Give Drain Masters Plumbing a call. In the meantime, here is how yo may be able to tell if your unit is repairable or if it is time to retire it. It can be very disheartening to hearing a loud humming noise instead of the usual spinning sounds of your disposal’s blade. However, this situation could in ways be a good thing. Although garbage disposals are built to handle an enormous amount of wear and tear, they can get clogged. When this occurs, the kick-off switch is activated so as to preserve the motor from burn out. Typically, cleaning out the disposal and resetting restores it to normal function. We have come across disposals that leak water, either at rest or while running. These situations are telling signs of significant part wear within the disposal. In our experience, we find that repairing a unit by replacing parts is not an economically viable solution. First, the parts can be expensive relative to the cost of a new unit. Second, typically if internal parts have worn to the point of replacement, the warranty is usually expired. Consequently, it is easy to understand why most lean towards buying a new garbage disposal. Call your Garbage Disposal Repair Specialist in San Diego County today 619-741-4366.